Full blown gastric dilatation-volvulus begins with bloat (dilatation) whereby the stomach swells with gas, fluid or food and develops into painful twisting and rotating of the stomach (volvulus), which is far more serious and difficult to treat. If bloat is detected early, the catastrophic effects of gastric dilatation-volvulus can be prevented. Bloat may occur in all dogs to some extent after a meal, but most will typically belch or vomit to relieve the build-up. If the stomach is twisted, belching and vomiting becomes impossible and the gas is trapped rather than relieved. Several factors contribute to the occurrence of bloat and most of these are preventable. Sometimes a dog will take in lots of air when eating (hence why encouraging slower eating is important - check out VioVet's range of slow feeders) or fermenting food in the stomach causes a build-up of gas. Bloat can also develop when a dog drinks lots of water or exercises immediately before or after eating. This causes the stomach to swell uncomfortably – in some cases, to such an extent that the stomach twists and rotates. When this happens, the dog is at high risk of deterioration and death. In fact, even with treatment, as many as 30% of dogs will die. As the stomach rotates, the esophagus is closed off meaning there is nowhere for the gas to escape from. Loss of blood to the stomach, spleen and other organs can occur as the build-up of gas traps blood vessels. At this point, it is likely the dog will go into toxic shock and deteriorate quickly. Immediate veterinary help is essential if the dog is to survive. What are the signs my dog has GDV? Because of the nature of the condition, early detection is paramount. Most dogs with bloat will display common signs of discomfort such as restlessness, lethargy, excessive salivation, panting and anxiety. If your dog is vomiting, it probably has bloat that has not yet progressed to stomach twisting or volvulus. 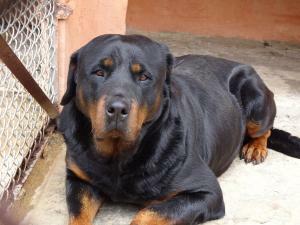 If, on the other hand, your dog is retching or straining but not producing anything, the problem could be more serious. Other signs to look out for include difficulty breathing, abdominal hardness and evidence of distended stomach. This might appear as protruding ribs or a peculiar fullness in the abdominal area. Try gently pressing the stomach to gauge your dog's reaction; if it is tender to touch and your dog shows visible signs of pain, take it straight along to the vet. If your dog's condition has already progressed to gastric torsion, the signs are likely to be more obvious and severe. Pale and/or cold lips are a sign your dog has probably gone into shock. Ideally, you should check this as soon as you start noticing symptoms and go from there. If you have a large breed dog such as a Great Dane, Mastiff, German Shepherd, Rottweiler, Boxer, Dobermann, Setter or St. Bernard, you should pay particular attention to the signs and symptoms as these breeds are most susceptible to GDV. Preventing bloat and gastric torsion in susceptible dogs is not always fail-safe. But luckily there are a number of things you can do to minimise your risk as much as possible. First of all, bear in mind what you are feeding your dog. Most dogs who suffer from bloat eat large quantities of dry kibble. This absorbs water and swells. A simple test would be to fill a bowl with your dry kibble and submerge it in water. Leave the bowl overnight and have a look in the morning to see whether the water has been absorbed and how much the kibbles have grown. Gauge yourself whether the amount the kibbles have swollen would cause an uncomfortable swelling in the gut. If you think it would, change onto something else. Some people suggest it may even be worth adding a little water to the dry kibble before feeding it, in order to help with digestion. If it is practical to do so, consider an alternative diet that incorporates raw and/or holistic ingredients. Bear in mind that cereal-based foods cause lots of fermentation - a leading cause of excessive gas. Try to avoid these where possible. Also consider how much you are feeding your dog. Like horses and humans, dogs are better suited to eating small meals more regularly rather than one or two large meals a day. You don't want to overload the stomach or leave it so that your dog is starving hungry and wolfs down its food. Feeding small meals regularly also helps absorb stomach acid in the gut and keeps the digestive processes ticking over. Encourage slow eating by placing a ball or toy in the food bowl or invest in a slow feeder - specially designed to extend the feeding process. Avoid exercising your dog before and after eating. This is especially important after a meal as food is still being digested. Some experts suggest a window of 2 hours after food before exercise or any sort of activity can commence, therefore allowing food to be properly processed. It is also recommended that water is withheld for 30 minutes after feeding so you don't overload the stomach. In short, be wary of what and how much you feed your dog throughout the day and pay particular notice to their behaviour after a large meal. Allow your dog to rest and relax until the food has been digested and keep water away for a short period. We know ourselves how exercising on a full stomach can cause indigestion and discomfort but for dogs the result can be much more serious. If you suspect your dog has bloat, take it along to the vet straight away. The sooner the condition is dealt with, the less likely it is to develop into gastric tortion. Hi, I was wondering if I could share this article on my blog please if I link back to your site. I am glad your found the information useful. Feel free to share the article on your blog, providing you link back to our site. Thank you Hannah, I will give you the link when I put it up just so you can check and make sure everything's in order. I have a Red Setter and I am so careful by having a very regimented feeding and excercise routine. My dog has got used to having a quiet time both before and after eating to prevent the onset of bloat. I have known several people who have had Setters who have suffered an early death through Bloat as the owners were ignorant of the condition. I have never seen any literature in a veterinary practice about this but surely it should be publicised more and owners of these more suseptible breeds should be advised of Bloat when they register their dog with a veterinary practice. I knew about this as I have known two German Shepherds that had Gastric Tortion and unfortunately both died within a very short time. It is something all dog owners need to be aware of. My labrador is now 13 but like most labs always bolts her food, slowing them down is a good idea. Thanks for the article. I was previously unaware of this particular issue but have always taken care to have a reasonable gap between meals and exercise. I have shared it on my Facebook page and will pass on to others not connected there. one of by dogs got bloat and a ruptured spleen, fortuneatly thanks to a fantastic vet and my dogs wish to live he went on to live for another 8yrs. I have experienced bloat with my 9 year old boxer. We got her to the vet in 20 mins Sadly she didn't survive as she also has a tumour on her spleen. . It's an awful thing for any pet to suffer. I now have a one year old boxer and currently feeding on James kibble. I do sometimes wonder if I should change from dry kibble. Bloat is always on my mind with him. Me and my husband were also totally unaware of this complaint, but we had a german shepherd that suffered severe bloat overnight, we took him to the vets to get him checked and he diagnosed him with bloat and wanted to keep him in for "Observation" I decided to take him home as i thought he would be better in my care as i could watch him more closely than being in a cage at the vets, 2 hours later his stomach twisted and went into shock, he died within 10 minutes a horrible death, im angry that the vet did nothing to ease his pain or his gas, they still charged me a hefty bill and we lost our beloved dog Ben who didnt deserve to die like this. I was wondering why your list of dogs at risk from bloat did not include greyhounds. At the greyhound rescue centre where I volunteer we always give out advice such as you have given here and as a consequence have reduced the numbers of dogs getting bloat considerably during the last 10 years or so. I wasn't aware it was such a problem with other breeds. Many thanks for highlighting this problem. Hi, I've been led to beleive that deep chested dogs, such as Boxers, shoud eat from raised bowls as this helps avoid Bloat. I didn't find any mention of this on your blog. Is this correct?